On April 2, Hays County commissioners adopted updates to 11 voting precincts, which were required to keep the county in compliance with the Texas Election Code. Five Kyle/Buda area precincts were affected and subdivided into 14 newly drawn precincts, as required by election law because they are at or near the 5,000 maximum number of registered voters permitted. Registered voters in the affected precincts can expect to receive new voter registration cards prior to the November 2019 elections. 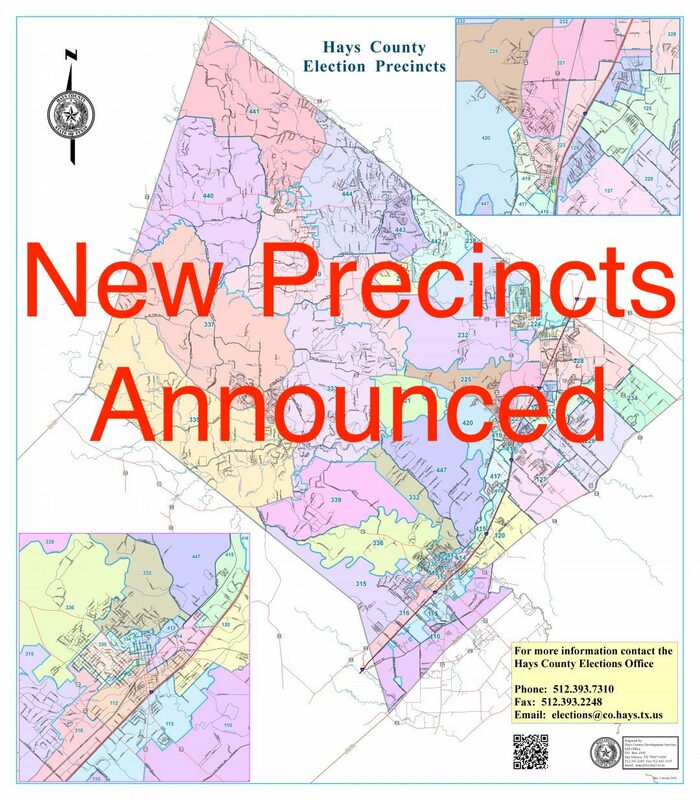 Because of the changes, the Hays County Democratic Party will soon need to fill precinct chair positions for the new precincts in the Kyle/Buda area. HCDP’s County Executive Committee (made up of precinct chairs) plans to discuss the process to nominate and approve new precinct chairs at its meeting this Sunday, April 14, at 1:30 p.m. The meeting will be held at the HCDP Headquarters, 215 W. San Antonio Street in San Marcos. If you are interested in serving as a precinct chair in one of these affected precincts, please consider attending this meeting to learn more about the process and what the job responsibilities entail. This process is only dividing large precincts along natural boundaries, it's not redistricting and does not affect the voting boundaries for any district. These changes will have no impact on which candidates residents get to vote for. Maps of the new voting precincts are available on the County’s website. Anyone with questions about the precinct change can contact the Elections Office at 512-393-7310 or email elections@co.hays.tx.us. The maps linked in the article only have major boundary streets labeled, the county GIS office doesn't expect to have new zoomable maps with all streets labeled up on the website until next week. KBAD is working to create a list up of the neighborhoods in each new precinct and which will need a chair. Click here to view a PDF of the voting precincts that were recently redrawn because they are at or near the 5,000 maximum number of registered voters permitted.